I'm developing an app with Xamarin Forms from 7 months. My app worked very well. I have done 1 month on Android side, because I fixed some bugs and added some features. This codes on Android work perfectly. On iOS this codes work perfectly but if i try to scroll the list, I have that Exception. A important thing is that this Event do not fire when I scroll the List. If I open the page and after do nothing, all work perfectly. I do not manage in any way scrolling or similar. I have viewed the code of Xamarin Libraries and seems That Grid.ColumnDefinitions at some point became null. so I think that the null reference exception is caused by _columns var. As you can see in my xaml code I have set ColumnDefinitions. This error happens when the list has already been created and displayed so.. someone set this to null at some point or Layout.UpdateChildrenLayout fails to get ColumnDefinitions value? Another observation is that I set ItemSource of listView inside OnAppearing method; when I reload page, I clear my list object and I re-insert all updated items to list. But I think that this is not a problem because my list's items derived from INotifyPropertyChanged and my list is a ObservableCollecion list. To make more specific tests, I imported the Xamarin Forms projects in my project. As you can see, the var _columns is null. I created a sample project based on the code you provided but I wasn't able to reproduce the issue. Can you attach a complete and minimal reproduction project so I can look into this some more? Thanks! From what I understand, it happens if you have a Grid Element in a AbsoluteLayout. Because each time an item is updated, inside an AbsoluteLayout triggers the event ChildOnPropertyChanged. If Grid element is refreshed too faster in small time, can happen that while Xamarin.Forms.Core use the variable '_columns' inside UpdateChildrenLayout, the method InvalidateMeasureInternal can set _columns to null. Anyway when I go to home I will upload a test project. @SteeBono ... I'm facing the same issue but on the _rows column and on android (works fine on iOS). Were you able to find a fix? Hi, if I remember correctly the problem was caused by a too fast update of the items in the list. Now I'm using FastCell dev by GeorgeCook. I recommend you, because they are really fast. In addition to this, I also decided to load the items of list in groups instead of loading them individually. I can not tell you for sure if this is what has solved my problem. 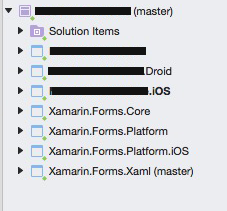 I have this problem too (Xamarin Forms/iOS 2.5.0.12). My guess is this is a race condition bug. First call might set _columns=null in the middle of Layout.MeasureGrid() execution right between code checking _columns to be not-null and code accessing _columns. For me this looks like a bug in Xamarin.Forms. for almost every grid i was using. 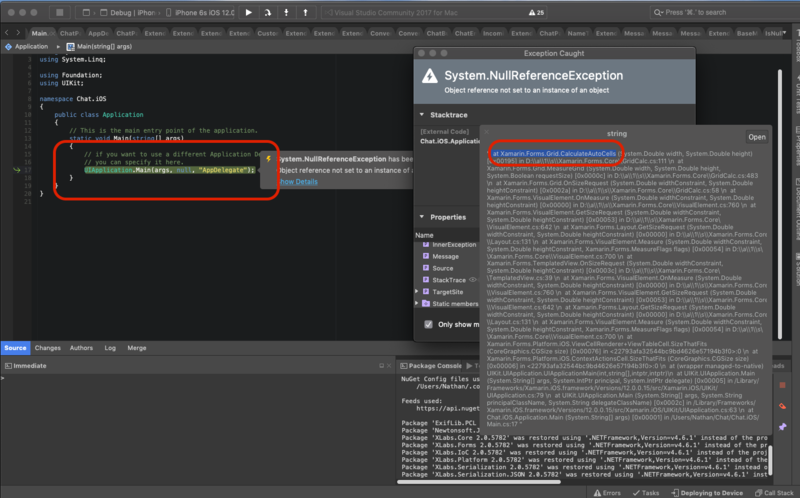 For the xamarin team it would be cool to edit the code adding a null check inside..
My theory: when specifying SizeChanged event handler in XAML for a grid it sometimes randomly get called before the grid is initialized = internal crash when trying to build params to pass to event handler. Work around: specify the SizeChanged += YourEventHandler in code behind, in constructor, after InitializeComponent line. 1 when i had a SizeChanged="MyHandler" inside xaml; workaround: delete this in xaml and set same in code behind the SizeChanged+=MyHandler as described in my post above. 2 when i had a stacklayout inside a grid. this one crashed totally randomly. Sometimes at app start StackLayout tryes to change its size when the parent grid didn't create its columns/rows yet and it crashes. Workaround: obviously avoid this combination as hell. Woah thanks for the update! I will look into it, thank you! ^ Just a simple cell template, use a grid to store a label. I Hardcoded AAAAAAAAAAAAAAAAAAAA for the Text. ^ Then I move the Label to another ContentView. As you can see it's a very simple one, with just only a label. I also found that if I have a short string like "ABC", no exception will be thrown.... so i suspect the issue is somehow related to the calculation of UI? Just that when you have a label inside stacklayout that is inside a grid you randomly get crashes. Yammy. Just avoid it. 11-01 12:23:40.180 I/MonoDroid( 6482): System.NullReferenceException: Object reference not set to an instance of an object. 11-01 12:23:42.820 E/mono ( 6482): System.NullReferenceException: Object reference not set to an instance of an object. 11-01 12:23:42.820 E/mono-rt ( 6482): [ERROR] FATAL UNHANDLED EXCEPTION: System.NullReferenceException: Object reference not set to an instance of an object. I haven't seen these issues personally, but if anyone can create an example app that replicates the error, even if doesn't replicate every time but just 1 in 10, I'm sure Xamarin would fix it. I'm also facing this issue, any one find workaround for it? Seeing these kind of crashes from our iOS app, Xamarin Forms 2.5. What is the status of this? Fixed in XF 3.0 or later? This is happening to me too but only in production. I'm seeing it in my crashes in the App Center Diagnostics section. It's never happened a simulator or on one of my test devices. I solved using FastCells and ObservableCollectionFast. Put item inside binding list with AddRange(). I think that this bug appear when you load too many item in a list inside a Grid and an internal Xamarin method set a variable to null while another method use that variable. After those edits to my code, this bug is disappeared. The Issues happen mostly if the network connection is quite bad, initially if ffimageloading not cached the image. Can anyone tell me how i find the custom component that is the reason for the crashes? Should i really avoid using StackLayouts in Grid?